I completed my drawing on trace paper/mylar. 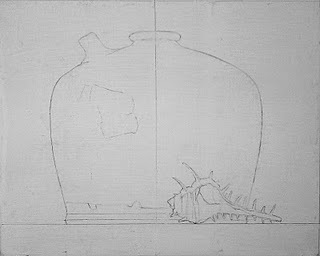 I ended up drawing the spiney seashell on another piece of trace overlaying the drawing of the pot. Then I scribbled with a soft 4B pencil on the back of the paper, and transferred the drawing to panel by tracing over it with a hard pencil. I spent a lot of time lining up everything so the horizon line of the shelf is straight and the vertical access of the jug is truly plumb. Any error in this image is due to photo warping. wonderful; I love your demos, and your open heart!